Department of Oral And Maxillofacial Pathology, Saveetha Dental College, Chennai-600037, Tamil Nadu, India. Citation: Renu R, Ramani P, Natesan A, Premkumar P, Sherlin HJ (2017) A Systematic Review on the Predominant Apoptotic Pathway Involved in the Pathogenesis of Pemphigus Vulgaris. Skin Dis Skin Care. 2:21. Background: Pemphigus Vulgaris (PV) is a potentially life-threatening autoimmune disease targeting the skin and mucous membranes, characterized by apoptolysis novel archetype of keratinocyte damage. This links the suprabasal acantholytic and cell death pathways to basal cell shrinkage rendering a 'tombstone' appearance to these lesions. Comprehending the acantholytic pathways leading to the blistering in PV is a key to development of novel treatments. Objective: The objective of this systematic review is to determine predominant apoptotic pathway involved in the pathogenesis of Pemphigus vulgaris and if it plays a crucial role in yet another pathogenic mechanism-apoptolysis. Methods: Articles were searched in PUBMED, EMBASE, MEDLINE and a thorough Google search was done. Hand search of Journals were also performed. The Articles were reviewed and analysed. Results: Out of 25 potentially relevant articles, 5 were excluded on the grounds of exclusion criteria, and 6 were excluded being review articles. However 2 articles among these were included by internet search and hand search. Of the total 14 relevant articles reviewed, the resulting data were collected and tabulated. Conclusion: The inference drawn from this systematic review is that the predominant apoptotic pathway involved in the pathogenesis of pemphigus vulgaris is the extrinsic pathway (86% of the reviewed studies). Evaluating factors involved in both intrinsic and extrinsic apoptotic pathways in the same study might provide an insight into the Apoptotic mechanism in pemphigus vulgaris giving a breakthrough for better targeted therapeutic modalities for the same. Pemphigus Vulgaris (PV) is a life-threatening autoimmune mucocutaneous blistering disease associated with IgG antibodies targeting several types of keratinocyte antigens and eliciting epidermal clefting (acantholysis) via intracellular signalling activating apoptotic enzymes (apoptolysis) . It is a relatively rare disease with an incidence of 1-3.5 cases per 100,000 individuals showing an increased frequency among the middle aged individuals . The stratified squamous epithelium of the oral cavity expresses largely Dsg3 (skin expresses Dsg1 as well as Dsg3) and therefore in PV mainly IgG antibodies are deposited intercellulary directing against these extracellular domains particularly of Dsg3 , where the oral lesions appear at an early stage. Development of Dsg1 antibodies in PV correlates with disease progression , and the appearance of antibodies against Dsg1 heralds involvement of skin and mucosae other than oral mucosa [5-7]. Various mechanisms have been proposed to describe the role of pemphigus autoantibodies in disruption of keratinocyte adhesion. The suggestion that the IgG inhibited Tran’s interactions of desmosome adhesion proteins across the adhesive interface, a mechanism known as the steric hindrance hypothesis was proposed based on the observation that pemphigus IgG were directed against the desmosomal cadherins dsg-1 and dsg-3. Alternative hypotheses explained was the intracellular signaling that leads to loss of adhesion, antibody induction of keratinocyte apoptosis , and the third being depletion of cell surface Dsg3 by its internalisation. The process of apoptosis may be divided into an initiation phase and an execution phase. Initiation of apoptosis occurs principally by signals from two distinct pathways-the intrinsic, or mitochondrial, pathway, and the extrinsic, or death receptorinitiated, pathway [9,10]. Intrinsic pathway of apoptosis is the result of increased mitochondrial permeability and release of pro-apoptotic molecules (death inducers) into the cytoplasm . When cells are deprived of survival signals or their DNA is damaged, or misfolded proteins induce ER stress, sensors of damage or stress are activated13. These sensors are also members of the Bcl family, and they include proteins called Bim, Bid, and Bad that contain a single “Bcl-2 homology domain” (the third of the four such domains present in Bcl-2) and are called “BH3-only proteins [11-13]. These sensors in turn activate two critical (proapoptotic) effectors, Bax and Bak, which form oligomers and insert into the mitochondrial membrane thus creating channels that allow proteins from the inner mitochondrial membrane to leak out into the cytoplasm. BH3-only proteins may also bind to and block the function of Bcl-2 and Bcl-x. At the same time, there is a decline in the synthesis of Bcl-2 and Bcl-x . The result of Bax-Bak activation coupled with loss of the protective functions of the anti-apoptotic Bcl family members thereby results in the release of the mitochondrial proteins into the cytoplasm that can activate the caspase cascade. Once released into the cytosol, cytochrome c binds to a protein called Apaf-1 (apoptosis-activating factor-1, homologous to Ced-4 in Caenorhabditis elegans), which forms a wheel-like hexamer that has been called the apoptosome . This complex binds to caspase-9, the critical initiator caspase of the mitochondrial pathway. This thereby initiates the executioner caspases 3, 6 and activates the endonucleases thus breaking down the cytoskeleton. The extrinsic pathway is initiated by engagement of plasma membrane death receptors on a variety of cells [14-16]. The TNF receptor family contains the death receptors and contains a cytoplasmic domain involved in protein-protein interactions that is called the death domain because it is essential for delivering apoptotic signals. The commonly known death receptors are the type 1 TNF receptor (TNFR1) and a related protein called Fas (CD95). The ligand for Fas is called Fas ligand (FasL). When FasL binds to Fas, three or more molecules of Fas are brought together, and their cytoplasmic death domains form a binding site for an adapter protein that also contains a death domain and is called FADD (Fas-associated death domain) . FADD binds an inactive form of caspase-8 (and, in humans, caspase-10), via a death domain where multiple pro-caspase-8 molecules are thus brought into proximity cleaving one another to generate active caspase-8. The recruitment of executioner caspases leads to activation of endonucleases and breaking down of the cytoskeleton. • Part of the mechanism by which sera and IgG induce acantholysis. • A consequence of loss of adhesion and a result of acantholysis. The data presented by Pretel et al. taken together with a bulk of in vitro and in vivo results reported in the literature, establish a novel paradigm where PVIgG signalling links the suprabasal acantholytic and apoptotic pathways to basal cell shrinkage . The fundamental difference of apoptosis in PV in comparison to Stevens-Johnson syndrome (SJS) and Toxic Epidermal Necrolysis (TEN) is that basal cells shrink but do not die, rendering a ‘tombstone’ appearance to the basal layer. Therefore, a new term was required to distinguish the unique paradigm of cell damage and detachment in PV from other known forms of cell death . This was termed as apoptolysis . The landmark article in the understanding of pathogenesis of pemphigus was published in 1964, which demonstrated the presence of antiskin antibodies in the sera of pemphigus patients by indirect immunofluorescence staining . • Binding of autoantibodies to PV antigens. • Activation of EGF receptor, Src, mTOR, p38 MAPK and other signalling elements downstream of ligated antigens, elevation of intracellular calcium and launching of the cell death cascades. • Massive cleavage of cellular proteins by activated cell death enzymes leading to cell collapse, and tearing off desmosomes from the cell membrane stimulating secondary autoantibody production. • Rounding up and death of acantholytic cells . Ambiguity still persists in establishing if apoptosis precedes acantholysis or if it succeeds the same, both being mediated by the same death enzymes. This review aims at reviewing the existing literature to arbitrate the apoptotic pathway that holds the rein in the pathogenesis of pemphigus vulgaris. The search strategy was in accordance with the Cochrane guidelines for systematic reviews. Articles relevant to the search strategy were identified from search data bases of PUBMED, MEDLINE till the year 2014. Due to the limitation of studies on the apoptotic pathways in pemphigus vulgaris, we wished to exhaust all the possible articles; therefore a timeline was not included in the search. The article search included only those published in the English literature. An internet search was also done to obtain the relevant articles of our interest. The title of the articles and abstracts were reviewed. The full text of selected articles were retrieved and further analysed. The search methodology applied in PUBMED was using the following keywords: Search [(pemphigus vulgaris) OR autoimmune skin blistering disease) OR intraepithelial skin blistering disease) OR skin blistering disease) NOT sub-epithelial skin blistering disease)] AND [(apoptosis) OR apoptotic pathways) OR intrinsic apoptotic pathway) OR extrinsic apoptotic pathways) OR apoptotic mechanism) OR intrinsic apoptotic mechanism) OR extrinsic apoptotic mechanism) OR TNF-alpha) OR Death associated receptors) OR DISC complex) OR DR3) OR DR4) OR DR5) OR TRAIL) OR TNFR1) OR TNFR2) OR Anti mitochondrial autoantibodies) OR cytochrome c) OR caspases) OR IL-6)] (Table 1). In addition, an internet search was also done using the key words “Apoptotic mechanisms” or “intrinsic or extrinsic apoptotic pathways” and “pemphigus vulgaris”. Original studies on mediators of intrinsic or extrinsic pathway of apoptosis in pemphigus vulgaris group of lesions. • Studies where the samples are obtained from the patients manifesting the disease in active or remission state. • Studies where the clinical manifestation of the disease includes cutaneous or mucocutaneous or oral manifestations. • Studies where the patients diagnosis was confirmed with histopathology or immunoflourescence techniques. • Studies performed using PCR, ELISA, immunoblotting techniques, TUNEL analysis, FACS, Extracellular flux measurement. • Studies in English literature were included. • Studies where the signalling events in apoptosis were analysed without establishing the type of apoptosis. • Studies on other pemphigus variants were excluded. • Studies on genetic polymorphism. • Studies that did not specify sample size. • Articles that were retracted. • Studies which were based on the geographical areas. Once the articles to be reviewed were finalized, data was extracted from each article, tabulated and was verified and interpreted (Figure 1). The outcomes assessed in this review examined and analysed the apoptotic pathways-intrinsic or extrinsic pathway involved in the Apoptolysis involved in pemphigus vulgaris disease process. The selection and exclusion of the reviewed studies are summarised in Figure 1. The search strategy identified fourteen studies that determine various pathways in the apoptotic mechanism, now termed apoptolysis in the pathogenesis of pemphigus vulgaris a skin blistering lesion. The description of the individual studies is shown in Table 2, and that of the excluded studies in Table 3. Tabulations have also been done to categorize the studies on the basis of the changes in the levels of the predominant variables that play a role in the apoptotic pathways involved in the same. Apart from the fore mentioned tabulations to increase the resolution of this systematic review, categorisation of the studies were done in order to show the denouement of therapy to the changes in the levels of the variables of interest to establish their role in the pathogenesis (Table 4). 1 D’Auria et al. 1997 25 patients with PV,20 healthy volunteers 18M, 7F, 30-76 years (Mean range of 54 years). 3 patients presented with only mucosal involvement. The patients presented median number of lesions, N=7 (Range 1-52).Controls were 14 M and 6 F,31-78 years (mean range50years) Patient sera healthy volunteer sera Blister fluid ELISA 13 Different cytokines were assessed. • TGF β • Significant increase in TNF α levels and IL 6 in a coordinated fashion with significant correlation (p<0.001) (r=0.84). • IL 6 • Patients with PV higher levels of ICAM-1 in blister fluid. • TNF-α • Presence of IL α and TNF α in lesional and perilesional areas. Confirmed by overexpression of cytokines in vivo using PCR. • Inhibition of caspase 8 blocked pemphigus sera induced apoptosis in keratinocyte cell cultures. • Flip-1 • Upregulated levels of mRNAs of caspases 3 and 8, Fas-L by 15, 30, 35 times respectively in patients sera after therapeutic administration and 40, 30, 35 times prior to the therapy (p<0.05). • TNF-α • Serum IL-6 concentration in PV active group and PV remission group was significantly higher when compared to the controls (p<0.05). • FasL Caspase 3,8,9 Isolation of various antimitochondrial antibodies of molecular weight 25, 30, 35, 57, 60, 100 kDa (p<0.05). Their absorption abolished the ability of PVIgG to cause keratinocyte detachment in vitro and in vivo. • Elevation of cytochrome c levels. • Elevation of FasL levels (p<0.05). Synergistic action of intrinsic and extrinsic pathways. Not Studied Absorption of antimitochondrial antibodies inhibited the ability of PVIgG to induce acantholysis in the monolayers of human KCs. • Phagocytic infiltrate • Increase of apoptotic cells in dermis and epidermis of patients with PV along with activation of caspases-3. • Increase in TNF-α in the skin of patients with PV. 12 Moravvej et al. 2011 10 patients newly diagnosed with PV (2 mucosal variant, 5 mucocutaneous variant, 3 cutaneous variant) 6 female,4 male, median age of 50.5yrs Blood samples (5 ml) Sandwich ELISA sFas • Patients with mucosal skin involment had higher median levels of sFas compared to the patients with cutaneous involvement. • Increase in intracellular ROS. Table 2: Description of included studies. Table 3: Description of excluded studies. Table 4: Variables of interest. All the included studies have studied the various mechanisms in the pathogenesis of pemphigus vulgaris, an autoimmune skin blistering disease. Twelve of the studies have assessed the involvement of extrinsic apoptotic pathway via Death Inducing Signalling Complex (DISC) in the apoptotic mechanism in the pathogenesis of pemphigus vulgaris. Two of the studies on the other hand have discussed about the role of intrinsic pathway involving the antimitochondrial autoantibodies by rendering a synergistic effect with the extrinsic pathway of apoptolysis in the pathogenesis of pemphigus vulgaris. Five of the included studies have shown the change in levels of the integral components playing a role in extrinsic and intrinsic apoptotic pathway involved pemphigus vulgaris’ pathogenic mechanism post therapy thereby providing the evidence to establish the occurrence of the same. Due to heterogeneity of the reviewed studies, a meta-analysis could not be performed. Yet a systematic review was conducted and the collected data were tabulated and analyzed. Pemphigus (from the Greek pemphix, meaning bubble or blister) is a mucocutaneous disease in other words an intraepidermal blistering autoimmune disease that is morphologically characterized by loss of cell-cell contact between neighbouring keratinocytes, referred to as acantholysis. PV is associated with autoantibodies against the transmembranous desmosome cadherins desmogleins Dsg 3 and Dsg 1 . Although there is a fairly broad consensus that apoptosis can be observed in pemphigus IgG induced disease processes, there remains an ongoing discussion about whether apoptosis is a (i) cause (ii) result (iii) “by-product” of acantholysis . Similar to anoikis which is a special form of apoptosis of epithelial cells triggered when cells become detached from its substructure it would be straightforward to consider apoptosis as a consequence of acantholysis . The main adhesive forces between cells in the suprabasal layers of the epidermis are adherens junctions and desmosomes therefore; anoikis seems to be unlikely to be important in pemphigus . As early as 1994, Sayama et al., and later other groups, reported upregulation of soluble Fas ligand in either PV patient sera and, or skin, suggesting that apoptosis in the target organ skin is triggered via the Fas/FasL system [17,21-23]. Several authors also noted the presence of the inflammatory cytokines TNF-α, IFN-γ, and IL-1 in the lesion exudates, which led them to suggest that inflammatory mediators could contribute to the induction of apoptosis in pemphigus . Similarly, Pacheco et al. suggested that CD8+FasL+ lymphocytes in pemphigus skin may have a role in inducing apoptosis . This systematic review aims at understanding the predominant apoptotic pathway that is involved in the apoptotic process in the pathogenesis of pemphigus vulgaris. Analysis of the result from the studies reviewed from Figure 2 showed 86% of the studies involved in the review favouring for exclusively for extrinsic pathway whereas, 7% preferred involvement of exclusively intrinsic pathway, however 7% backed for the coexistence of intrinsic along with the extrinsic pathway. 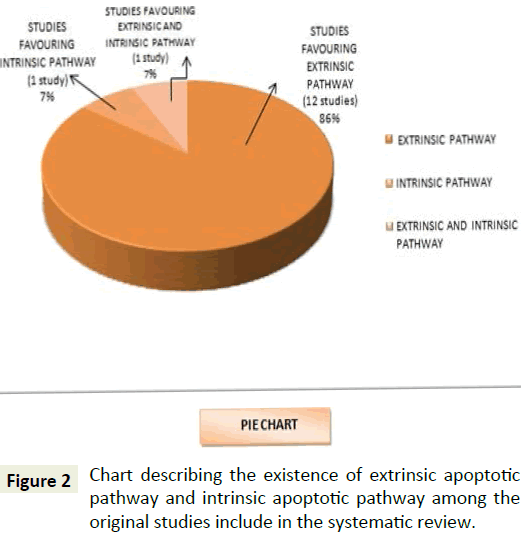 Figure 2: Chart describing the existence of extrinsic apoptotic pathway and intrinsic apoptotic pathway among the original studies include in the systematic review. The extrinsic pathway acts through the death receptors that are the cell surface receptors which transmit apoptotic signals initiated by specific ligands such as Fas ligand, TNF alpha and TRAIL via the generation of ceramide, typically produced by acid sphingomyelinase through the activation a caspase cascade within seconds of ligand binding leading to a rapid induction of apoptosis . TNF-α is produced by T-cells and activated macrophages in response to infection can show various effects on cells one being induction of apoptosis by activating its receptor, TNFR1. Binding of TNF alpha to TNFR1 results in receptor trimerisation and binding of an intracellular adapter molecule called TRADD (TNFR- associated death domain) thereby activating the extrinsic pathway of apoptosis . Binding of TRAIL (TNF-related apoptosis inducing ligand) to its receptors DR4 or DR5 triggers rapid apoptosis in many cells [24-30]. The studies by Chiapa et al., showed that TNF-α was present in the skin of patients with PV within the dermis. In vitro studies were also done proving that accumulation of apoptotic cells in PV could promote TNF-α production by monocytes, causing apoptosis closing the vicious cycle and suggesting the role of the extrinsic pathway . Similar studies on the levels of cytokines in the sera of the patients with PV by D’Auria et al. showed significant increase in the levels of IL-6 and TNF-α. Furthermore, after administration of corticosteroids therapy revealed a decrease in the levels of the same. Also there was a significant correlation between the lesional manifestation and the levels of TNF-α and IL-6 . Ragab et al. evaluated of the levels of TNF-α in the sera of patients with PV in which they noted a positive correlation between the levels of TNF-α and stress in the initial weeks of the disease, among those who had a bad disease outcome showing the downstream apoptosis by the extrinsic pathway . Also Alecu et al. in 1999 showed elevated ICAM- 1, ELAM-1, TNF-α, IL-6 levels in both serum and blister liquid of patients with PV (Tables 5-8) . Table 5: Studies on the role of TNF-α. Table 6: Studies favoring the involvement of extrinsic pathway. 4 Marchenko et al. Post treatment no increase in the proapoptotic gene expressions. Table 7: Studies analysing the levels of variables post therapy. Table 8: Levels of evidence for included studies. Studies by Feliciani et al. in 2000 on the in vitro and in vivo expression of IL-1α, TNF-α mRNA in patients with PV showed overexpression of the same in the patients and sand blocking these expressions also revealed a decrease in the disease activity in animal models which indicated potential involvement by activating the extrinsic pathway of apoptosis . Narbutt et al. in 2008 on the estimation of serum concentration of IL-6 shows an increased concentration in both active and remission stages, and also shows a negative correlation between the TNF-α levels among the active and diseased state individuals. This expression of TNF-α expression highlights the role of extrinsic pathway of apoptosis in PV . Another study done by the same author in 2010 on the pathogenic activity of circulating anti-desmoglein autoantibodies reveals increase in the levels of TNF-α mRNA in HaCaT keratinocytes again demonstrative of the apoptotic mechanism involved via the extrinsic pathway . Figure 3 shows that 39% of the studies that are included in our systematic review have used TNF-α as a variable to show its elevated levels in the study group thereby substantiating the role of extrinsic pathway of apoptosis in patients affected with pemphigus vulgaris. Figure 3: Percentage evaluvation of the proapoptotic factors included in the original studies. Binding of the ligand Fas (FasL or CD95L) promotes receptor clustering, DISC formation and the activation of the caspase cascade via the extrinsic pathway. Interferon-γ (IFN-γ) induces caspase-8, sensitizing them to death receptor mediated apoptosis by increasing the cellular sensitivity to apoptosis by up-regulating expression of Fas and Fas ligand or by promoting surface expression of a TNF-γ receptor on tumor cells via JAK/ STAT pathway [25-29]. A membrane-bound molecule, the Fas ligand, expressed by CD8 , and some CD4 T cells, is also capable of inducing apoptosis by binding to Fas expressed by some target cells . Furthermore studies done by Wang et al. revealed the involvement of death signalling pathways via Fas-FasL mediators alone or in combination with IFN-γ, thereby heading towards the role of extrinsic pathway of apoptosis in the pathogenesis of pemphigus vulgaris . Moravvej et al. also revealed elevation in the soluble Fas levels that proving that; extrinsic apoptotic pathway is involved in pathogenesis of PV . Studies by Mario et al. respectively revealed an increase in the levels of Fas ligand in the antibodies of patients with PV and upregulation of Fas-L mRNA respectively, thereby being suggestive of the role of extrinsic pathway in the apoptotic mechanism behind the pathogenesis of PV . Figure 3 gives a representation of the percentage of studies using sFas/FasR/Fas-FasL, IL-1 or IL-6 as a variable included in this systematic review to be 28% and 22% respectively. Giurdanella et al. in 2013 on the possible role of CD8+T Lymphocytes in cell mediated pathogenesis of PV revealed an expression of CD4+, CD8+ T-Lymphocytes showing the possible role of apoptosis by initiating the Fas-FasL pathway i.e., the extrinsic pathway (Tables 9 and 10). Table 9: Studies on the role of Il-1 or Il-6. Table 10: Studies on the role of sFas/FasR/FasL. Mitochondria plays an important role in the regulation of cell death since they contain many pro-apoptotic proteins such as Apoptosis Inducing Factor (AIF), Smac/DIABLO and cytochrome C which are released from the mitochondria following the formation of a pore in the mitochondrial membrane called the Permeability Transition pore, or PT pore further leading to apoptosis through the activation of the caspase cascade. In the uninvolved skin of PV patients, edema and swelling of mitochondria with destruction of their cristae were observed, suggesting that mitochondrial damage precedes blister formation (Table 11). Table 11: Studies on the role of antimitochonrial antibodies, cytochrome c, mitochondrial parameters. Mina et al. suggested that mitochondrial antibodies contribute to the pathogenesis of pemphigus vulgaris by showing that PV antibodies altered the O2 respiration, disrupted electron transfer chain and increased the reactive oxygen species. The efficacy of mitochondria protecting drugs on the mitochondria were also proved by the ability of the drug combination (nicotinamide, minocycline, cyclosporine A)to abolish acantholysis in animal model thereby formulating a novel approach to development of personalised nonhormonal therapies of patients with potentially lethal autoimmune blistering disease [40,41]. Marchenko et al. in 2010 showed experiments revealed penetration of PVIgG into the subcellular mitochondrial fraction. The antimitochondrial antibodies from different PV patients recognized distinct combinations of antigens with apparent molecular sizes of 25, 30, 35, 57, 60, and 100 kDa. Figure 3 is a representation of the percentage of studies conducted on intrinsic apoptotic factors and shows that 11% of the review articles are suggestive of the same (Tables 12 and 13) . Table 12: Studies favoring the involvement of intrinsic and extrinsic pathway. 4. Marchenko et al. Post treatment no increase in the proapoptotic gene expressions. Table 13: Studies analysing the levels of variables post therapy. Studies on these pathways conclude that the signaling pathways triggered by autoantibodies in PV vary from patient to patient because a unique composition of the pool of autoantibodies apparently determines the preferential signaling pathways downstream of targeted self-antigens. Development of a new treatment of PV patients should be directed toward interruption of the key signaling events triggering apoptolysis [42,43]. Therefore apoptolysis relies upon a synergistic action of autoantibodies to several types of self-antigens, including adhesion molecules, mitochondrial proteins, other putative keratinocyte self-antigens like acetylcholine receptors, as well as serum and tissue factors, such as FasL, tumor necrosis factor α, cytokines, serine proteases, and nitric oxide. These autoantibodies synergise with the proapoptotic serum and tissue factors to trigger both intrinsic and extrinsic pathways of cell death and break the epithelial cohesion, leading to blisters . The antimitochondrial antibodies in PV patients were predicted by a ‘multiple hit hypothesis . By acting altogether, these factors become able to overcome the natural resistance and activate both the extrinsic and the intrinsic cell death pathways in KCs . From Figure 4 it is therefore evident that undoubtedly there is an involvement of extrinsic pathway (86%) in apoptotic process of PV from the original studies that are included in this systematic review. Recent experiments are also demonstrative of the role of intrinsic pathway also in the pathogenic process (7% shows the role of both extrinsic and intrinsic pathway, 7% shows exclusive involvement of intrinsic pathway). Figures 3 and 5 represent the number of studies included in this review to represent the various proapoptotic factors in PV and their percentage evaluation. Figure 4: Number of studies done to estimate the levels of various proapoptotic factors in pemphigus vulgaris. Figure 5: Treatment based studies done to estimate the changes in the levels of the apoptotic factor. Studies have been performed to shed light on the mechanism of therapeutic action of minocycline and nicotinamide, which have been empirically shown to be effective steroid-sparing agents in PV, as well as of the professional immunosuppressor cyclosporine A in preventing the skin blistering induced by PvIgG. Figures 6 and 7 shows the number of articles studied included in this systematic review correlating the disease outcome and levels of antiapoptotic factors (Figure 6) and change in the levels of apoptotic factors to therapy respectively (Figure 5). The combination of drugs most effectively protected mitochondrial respiration equally effectively antagonized the disease-causing activity of PVIgG in animal model. Thus, their synergistic potential is yet to be fully explored. 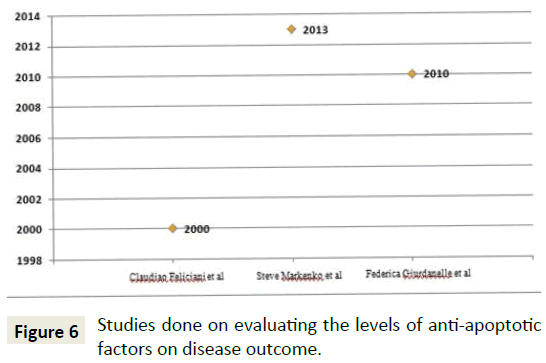 Figure 6: Studies done on evaluating the levels of anti-apoptotic factors on disease outcome. Figure 7: Total studies reviewed to determine the apoptotic pathways involved in pathogenesis pemphigus vulgaris. Lack of adequacy in the number of studies to ascertain the involvement of pathways in the Apoptolysis process using the proapoptotic factors of intrinsic and extrinsic pathway the uncertainty of the predominance of the extrinsic mechanism still persists. The herculean task involved in the estimation of the mitochondrial parameters coupled with cost effective nature of the procedure involved may be a reason for the same. Studies that helps to establish both the coexistence of intrinsic and extrinsic pathways of apoptolysis can be helpful in devising a targeted therapeutic approaches against the trigger of the apoptotic pathways involved in PV thereby decreasing the skin blistering and reducing the severity of the disease outcome. We acknowledge that the potential presence of publication bias might have occurred within this review. The number of articles reviewed is minimal. This is due to the limitation of studies available in apoptotic pathways involved in PV. Our search also included publications in the English literature only. No retracted articles were included. Further studies must be performed evaluating the outcome measures that could be useful in comparing extrinsic and intrinsic apoptotic pathways in the same platform in order to generate a more homogenous and unbiased group of data. This could aid in giving better systematic reviews in future in this field of study. Grando SA, Bystryn JC, Chernyavsky AI (2009) Apoptolysis: A novel mechanism of skin blistering in pemphigus vulgaris linking the apoptotic pathways to basal cell shrinkage and suprabasal acantholysis. Exp Dermatol 18: 764-770. Athanasios M, Timoklia O (2013) p38 MAPK signaling in pemphigus: implications for skin autoimmunity. Hindawi Publishing Corporation Autoimmune Diseases. Nishikawa T, Hashimoto T, Shimizu H, Ebihara T, Amagai M (1996) Pemphigus: from immunofluorescence to molecular biology. J Dermatol Sci 12: 1-9. Miyagawa S, Amagai M, Iida T (1999) Late development of antidesmoglein 1 antibodies in pemphigus vulgaris: correlation with disease progression. Br J Dermatol 141: 1084-1087. Ding X, Aoki V, Mascaro JM (1997) Mucosal and mucocutaneous (generalized) pemphigus vulgaris show distinct autoantibody profiles. J Invest Dermatol 109: 592-596. Harman KE, Gratian MJ, Bhogal BS (2000b) A study of desmoglein 1 autoantibodies in pemphigus vulgaris: racial differences in frequency and the association with a more severe phenotype. Br J Dermatol 143: 343-348. Beutner EH, Jordan RE (1964) Demonstrations of skin antibodies in sera of pemphigus vulgaris patients by indirect immunofluorescence staining. Pro Soc Exp Biol Med 117: 505-510. Meryem B, Puneet J, David S (2010) Rubenstein apoptotic pathways in pemphigus. Dermatology Research and Practice. Calkins CC, Setzer SV, Jennings JM (2006) Desmoglein endocytosis and desmosome disassembly are coordinated responses to pemphigus autoantibodies. J Biol Chem 281: 7623-7634. Danial NN, Korsmeyer SJ (2004) Cell death: critical control points. Cell 116: 205-219. Cory S, Adams JM (2002) The Bcl2 family: regulators of the cellular life-or-death switch. Nat Rev Cancer 2: 647. Riedl SJ, Salvesen GS (2007) The apoptosome: signalling platform of cell death. Nat Rev Mol Cell Biol 8: 405. Robins, Crotan (2010) Pathologic basis of disease pp: 28-30. Wallach D (1999) Tumor necrosis factor receptor and Fas signaling mechanisms. Annu Rev Immunol 17: p331. Nagata S (1999) Fas ligand-induced apoptosis. Annu Rev Genet 33: 29-55. Peter ME, Krammer PH (2003) The CD95(APO-1/Fas) DISC and beyond. Cell Death Differ 10: 26. Wang X, Bregegere F, Frusic ZM (2004) Possible apoptotic mechanism in epidermal cell acantholysis induced by pemphigus vulgaris autoimmunoglobulins. Apoptosis 9: 131-143. Wolf R, Matz H, Ruocco E, Ruocco V (2005) The putative role of apoptosis in the induction of pemphigus. Medical Hypotheses 64: 44-45. Pretel M, Espan A, Marquina M (2009) An imbalance in Akt/mTOR is involved in the apoptotic and acantholytic processes in a mouse model of pemphigus vulgaris. Exp Dermatol pp: 771-780. Schmidt E, Gutberlet J, Siegmund D, Berg D, Wajant H, et al. (2009) Apoptosis is not required for acantholysis in pemphigus vulgaris. Am J Physiol Cell Physiol 296: 162-172. Puviani M, Marconi A, Cozzani E, Pincelli C (2003) Fasligand in pemphigus sera induces keratinocyte apoptosis through the activation of caspase-8. Journal of Investigative Dermatology 120: 164-167. Pacheco TMG, Avalos DE, Vega ME (2009) The final destiny of acantholytic cells in pemphigus is Fas mediated. Journal of the European Academy of Dermatology and Venereology 23: 697-701. Sayama K, Yonehara S, Watanabe Y, Miki Y (1994) Expression of Fas antigen on keratinocytes in vivo and induction of apoptosis in cultured keratinocytes. J Invest Dermatol 103: 330-334. Tanya MT, Kejin Z, Grenetb J (2006) Evaluation of IFN effects on apoptosis and gene expression in neuroblastoma-Preclinical studies, Biochimica et Biophysica Acta (BBA). Mol Cell Res 1763: 1000-1010. Kate S, Paul JH, Timothy R, David A (2009) Hume, Interferon: an overview of signals, mechanisms and functions. J Neurochem 108: 1083-1096. Xu X, Fu XY, Plate J, Chong AS (1998) IFN-gamma induces cell growth inhibition by Fas-mediated apoptosis: requirement of STAT1 protein for up-regulation of Fas and FasL expression. Cancer Res 58: 2832-2837. Zheng H, Luo RC, Zhang LS, Mai GF (2002) Interferon-gamma up-regulates Fas expression and increases Fas-mediated apoptosis in tumor cell lines. Di Yi Jun Yi Da Xue Xue Bao 22: 1090-1092. Tsujimoto M, Yip YK, Vilcek J (1986) Interferon-gamma enhances expression of cellular receptors for tumor necrosis factor. J Immunol 136: 2441-2444. Janeway CA, Travers P, Walport M (2010) Immunobiology: the immune system in health and disease. Chiapa LM, Zentella DA, Leon DG (2011) Becker Pemphigus vulgaris: accumulation of apoptotic cells in dermis and epidermis possibly relates to pathophysiology through TNF-alpha production by phagocytes. Eur J Dermatol 21: 874-88. D'Auria L, Bonifati C, Mussi A (1997) Cytokines in the sera of patients with pemphigus vulgaris: interleukin-6 and tumour necrosis factor-alpha levels are significantly increased as compared to healthy subjects and correlate with disease activity. Eur Cytokine Netw 8: 383-387. Ragab N, Abdallah M, El Gohary E, Elewa R (2011) Stress and serum TNF-alpha levels may predict disease outcome in patients with pemphigus: a preliminary study. Cutis 87: 189-194. Alecu M, Alecu S, Coman G (1999) ICAM-1, ELAM-1, TNF-alpha and IL-6 in serum and blister liquid of pemphigus vulgaris patients. Roum Arch Microbiol Immunol 58: 121-130. Feliciani C, Toto P, Amerio P, Pour SM (2000) In vitro and in vivo expression of interleukin-1alpha and tumor necrosis factor-alpha mRNA in pemphigus vulgaris: interleukin-1alpha and tumor necrosis factor-alpha are involved in acantholysis. J Invest Dermatol 114: 71-77. Narbutt J, Lukamowicz J, Bogaczewicz J (2008) Serum concentration of interleukin-6 is increased both in active and remission stages of pemphigus vulgaris. Mediators Inflamm. Narbutt J, Boncela J, Smolarczyk K (2012) Pathogenic activity of circulating anti-desmoglein-3 autoantibodies isolated from pemphigus vulgaris patients. Arch Med Sci 8: 347-356. Giurdanella F, Fania L, Gnarra M (2013) A possible role for CD8+ T lymphocytes in the cell-mediated pathogenesis of pemphigus vulgaris. Mediators Inflamm. Moravvej H, Yousefi M, Farrokhi B, Mosaffa N (2011) Soluble Fas in pemphigus vulgaris. Arch Iran Med 14: 200-201. Kalantari DM, Chen Y, Deng W (2013) Mechanisms of mitochondrial damage in keratinocytes by pemphigus vulgaris antibodies. J Biol Chem 288: 16916-16925. Grando SA (2000) Autoimmunity to keratinocyte acetylcholine receptors in pemphigus. Dermatology 201: 290-295. Marchenko S, Chernyavsky AI, Arredondo J (2010) Antimitochondrial autoantibodies in pemphigus vulgaris: a missing link in disease pathophysiology. J Biol Chem 285: 3695-704. Grando SA, Terman AK, Stupina AS (1991) Ultrastructural study of clinically uninvolved skin of patients with pemphigus vulgaris. Clin Exp Dermatol 16: 359-363.